The embargo on the Nexus 6 has been lifted and I took the liberty of reading at least three reviews, numerous reddit threads and countless tweets. 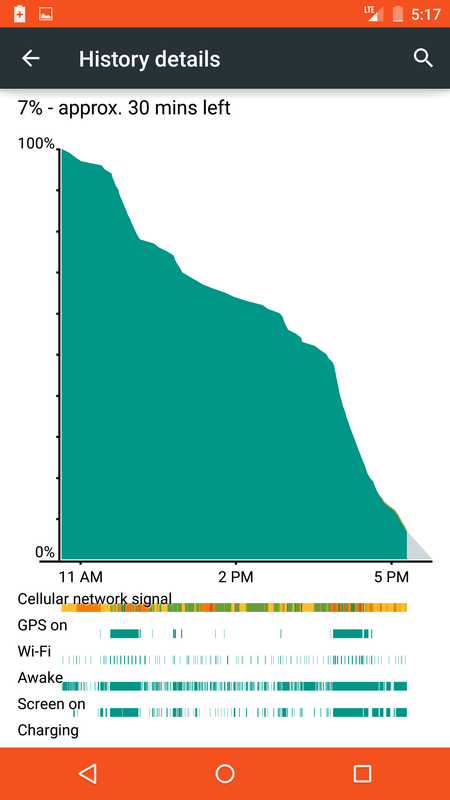 The most important concern of mine with the new Nexus 6 is the battery life. After all of that reading, I wanted to collate the once again strange battery life discrepancies these reviews have revealed. Compared to Samsung’s Galaxy Note 4 which has essentially the same specifications on paper, the Nexus 6 lasts 4.27 hours shorter. It is likely that this can be attributed to the display, which may not be as efficient as the latest and greatest AMOLED panel used in the Note 4. This beautiful graph, specifies the Nexus 6 below the Nexus 5 in “web browsing on wifi”: Nexus 6 scored 7.7 hours while the Nexus 5 scored 8.99 hours, which is a 14% difference. I have no idea what makes the Samsung Galaxy Note 4 score 11.97 hours in the wifi test, but that difference is kind of spooky, especially in considerations of stock Android, the lack of TouchWiz and the refinements to the OS that were alleged to boost battery life. There are other graphs in the review that show the Nexus 5, 6, Note 4, iPhones and others doing better than the Nexus 6 in a variety of “tests”. Update: Brandon, the author of AnandTech’s review on the Nexus 6, continued on Twitter a few days later after rerunning his tests on the Nexus 6 with the “late firmware update“. He says it made no difference. Android Police offer a less stinging opinion of the battery, but their charts show some numbing results. That said, I have found the Nexus 6 to have respectable battery life. Here’s a look at an average day with the N6. While using the Nexus 6, my brightness was almost always at maximum, and I was connected to mobile data exclusively. Their charts are not as organized as AnandTech’s, but plainly: ~1pm to ~10pm reaching down to 9% (which would result at 54 minutes at the current usage rate), and by the way, they say this was their “light day of use”. The heavier day usage is more akin to my usage so: ~11am to 5pm reaching down to 7%. The Nexus 6 has a 3220 mAh battery, which in my week or so with the device initially lasted a solid day and a half. Very heavy use did make it die out after 14 hours or so, while lighter use let me push it to two days. The Verge did not provide graphs of any kind (because it’s too hard for their readers to parse, perhaps), but there is no reason to disregard Dieter Bohn’s usage here so far. Despite the criticism The Verge recieves over their Apple affinity, this review and Dieter’s earlier sneak peak preview are fair. It is worth noting that The Verge scored the Nexus 6, 8.6 overall and 8 in battery life while the iPhone 6 Plus scored, 8.7 overall and 9 in battery life. The Note 4 scored an identical overall score to the Nexus 6 while its battery life score was 9 just like the iPhone 6 Plus. 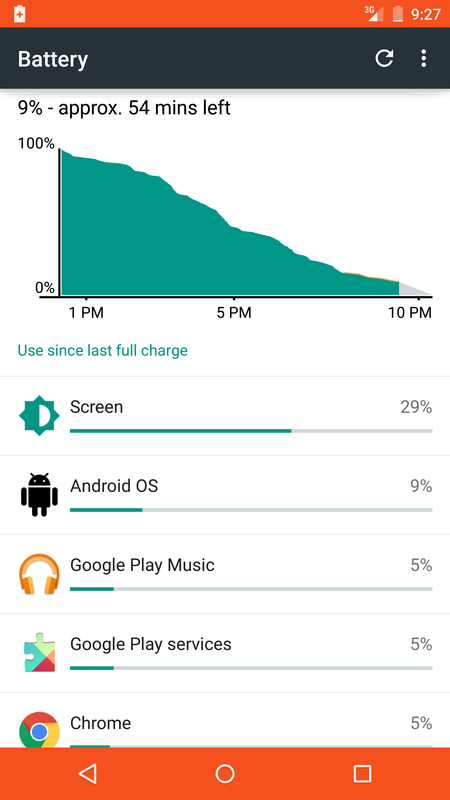 Three reviews of varying angles detailing the good enough or lackluster battery life of the Nexus 6. These are the battery life discrepancies that plagued the Moto 360 reviews as well, at least initially. The common opinion now seems to be the Moto 360 has “okay” battery life. To get any sensible result in these tests, it is clear that the reviewing needs to happen over a long time, and perhaps with the actual OS installed (because, in the Nexus 6’s case, there was a late update that could have changed something). It’s a shame that Google and their OEM provider struggle to make their products stand out in some of the most important factors. 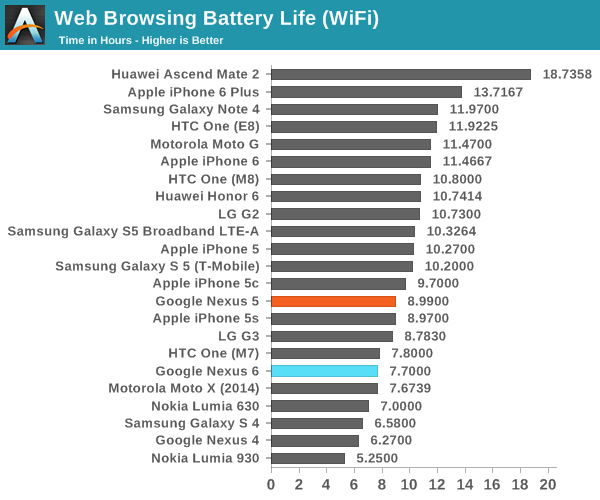 It is clear that nobody knows the true battery life expectations for the Nexus 6 yet. Which is fine, because right now, there is no stock – anywhere.